Whether you’re going to invest in a weighted blanket or you already have one, it’s important to know how to take care of it. The way you wash your quilt determines how long it’ll serve you. Yet, there are many factors to consider before you place your blanket in a washing machine. Here’s your handy guide to a proper weighted blanket care. How Long Do Weighted Blankets Last? 1 How Long Do Weighted Blankets Last? 2.1 What’s Inside and Outside? 3 Hand-washed vs. Washing Machine? 4 How to Hand Wash Weighted Blankets? 5 Do I Need to Air my Blanket Out Regularly? 6 How Often Should I Wash my Weighted Blanket? 7 What’s the Best Way to Dry a Weighted Blanket? Yes, your weighted comforter has an expiration date. If you don’t replace it on time, it could cause some health issues. But how to tell if you need to replace your blanket? There’s no exact expiration date since a lot depends on the fabrics and fillers and how good you take care of it. Even the cheapest weighted blanket could serve you up to 10 years. Some could even last for up to 15 years. It’s not that weighted anymore. You are more likely to notice these signs after at least 5 years. But if you wash it wrongly, an expiration date will be near. Read carefully the instructions before cleaning your blanket. Some of them won’t come with instructions, so we’ll give you a few tips. When buying a weighted blanket, make sure you consider the overall design and construction that might affect the blanket’s washability. The outer layers of heavy blankets aren’t created equal. Some weighted blankets feature a washable outer layer, which can be customized by texture, fabric, pattern, or color. You can easily remove the outer layer and wash only the outside like you’d with a duvet cover. Before washing, don’t forget to fasten snaps, velcro, buttons, or zippers to prevent snags. Also, try to wash it alone or with like colors to avoid a color hassle. Other heavy blankets feature irremovable covers and are constructed fully sewn together. Although the whole blanket is washable, the process is nerve-wracking. So, if you have a large weighted comforter without a removable cover, consider a professional laundering or head to the laundromat. Of course, you have to be especially careful is you are using a DIY weighted blanket, as depending on your skill it could be not as strong as when it was made by proffesionals. When you need to wash the whole blanket, it’s when the outer and interior material contents must be considered. The different combinations of fabrics and fillers require different approaches. Does your blanket contain polyfill, cotton fill, glass bead, poly pellets, or any DIY fillers? The contents affect durability and washability. Some fillers take ages to dry after washing, so read the instructions carefully. The outer layer may be easier to wash either by hand or in the washing machine. However, it’s crucial to consider the type of fabric as well. Fleece is super easy to wash with a gentle to mild-powered detergent. This fabric is washing machine friendly and can tolerate fabric softener. Wash it in warm water, rinse, and dry on low heat. If your fleece is about to pill, consider air drying only. If your heavy blanket has some stains, it’s better to soak it in warm water for 30 to 50 minutes before washing. Avoid using any bleach, especially those that contain chlorine. You may need to run an extra rinse to remove any extra detergent and fabric softener that may remain in the fabric. This will help prevent any allergic reactions and ensure your blanket is fluffy and soft. The plush minky fabrics are all the rage right now. First, because they’re easy to wash – even partially. Second, because they’re incredibly durable. Clean your minky quilt alone in a cold wash dry on air fluff or low heat. You can also hang it outside. Avoid using any fabric softeners! If you have a heavier blanket, you can just spot clean it. Use your old toothbrush and a bit of water to scrub out the stain. If the stain is stubborn, use an oxygen bleach or non-chlorine bleach to remove it. This fabric is prone to wear and tear, so use a cold or warm wash, but never hot. It’s also prone to over-drying, so dry on low heat or air dry. If your blanket is new, you can use a fabric softener. The older flannel blankets don’t require a fabric softener, but an extra rinse is a must. This will remove any extra residue that causes flannel to feel stiff. 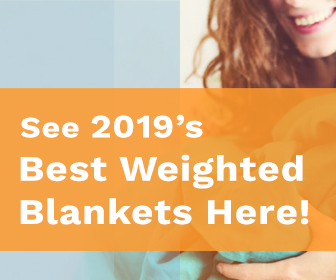 The majority of weighted blankets are made of 100% cotton (not counting fillers!). Depending on how dirty your blanket is, machine wash it in cold or warm water. Don’t dry clean. Dry only on low heat. If you need to keep your blanket’s color bright, add ½ cup of vinegar or cup of salt to the wash. Run an extra rinse at the end. These quilts are washed the same way, but if you need to remove a stain use oxygen bleach. Regular bleaches can weaken the cellulosic fibers. With this one, you can use a warm or hot wash. Dry on low heat and never use any bleaches, fabric softeners, or vinegar. Many people iron their blankets to kill bacteria. Don’t iron any heavy blankets, though. With a host of washing machine features, hand washing may not be needed at all. Even the most delicate fabrics can be washed in the machine. If you need to remove one stain though, you may simply spot clean it. If your blanket is more than 20lbs, it’s best to wash it in the laundromat. When it has too many stains, give to the professionals. How to Hand Wash Weighted Blankets? Fill your tub with cool or warm water and add a ¼ or ½ cup of mild detergent to it, depending on the weight and size. Don’t fill your tub fully to avoid the mess. Grab a part of the blanket and knead it with very soft strokes. Smooth it out and wash a new part. Keep doing it until each part of the blanket is cleaned. Drain the water. Fold your blanket in half and use your hands to apply a lot of pressure on it to remove excess water. Don’t twist or squeeze your quilt. Rinse the blanket with lukewarm water several times until the water in the tub becomes clear. Use the pressure method to remove excess water and dry your blanket inside or outside. Do I Need to Air my Blanket Out Regularly? Sometimes it’s enough to air the blanket in order to make it smell like a new. Whether you air it outside or you just open the window in the room for several hours, it’s a quick way to refresh a heavy quilt. Spot clean the stain if needed. The more frequently you air your blanket, the better. Airing helps to prevent the dust and bacteria from building up. How Often Should I Wash my Weighted Blanket? The frequency of cleaning your weighted comforter depends on how often you use it and where. If you use it occasionally and in a room that’s aired regularly, you can wash your blanket once a year. If you use it each day or when traveling, it’s best to clean it 2 to 4 times a year to kill the bacteria and dirt. Waterproof heavy blankets seem to require an occasional cleaning, but let’s not forget about the dust and bacteria. Experts recommend cleaning any blanket 2 to 3 times a year. Even if your blanket looks stain-free, it still must be cleaned. Don’t wash your heavy blanket too often, though. Not only can frequent washing damage the filler, but overall reduce the blanket’s lifespan too. Air your quilt frequently and spot clean it when needed. What’s the Best Way to Dry a Weighted Blanket? Almost all weighted blankets are rated for the dryer. However, it’s important to dry them on low to avoid overdrying the fabric and melting the poly pellet filling, or damaging any other filling. If you’re not sure about your blanket’s filling, choose a cool dry option. The hang dry method certainly remains the best way to increase the blanket’s lifespan. Since the spin cycle gets most of the water out of the quilt, it may take a few hours to hang dry. Hang your blanket evenly over the laundry line in order to help it maintain its shape. Don’t hang a weighted blanket from one edge. Don’t dry clean or microwave it. In order to speed up the drying process, hang it outside in the sun. But make sure, the weather isn’t windy. Otherwise, your blanket can collect the dust and all your efforts will be in vain. There you have it! Your practical guide to keeping your weighted blanket clean and alive for longer. Remember to read the instructions or ask the manufacturer before placing your blanket in a washing machine.